Digital Ultra High Speed RJ11 ADSL 2 Internet Broadband Modem and Router cable to connect your modem/Router to the Filter/Splitter plugged into your BT ADSL Wall Socket. The high speed ADSL cable transmits 10 times faster than any normal telephone cable for a clean and clear transmission. Externally shielded to minimize interference from outside sources. Lifetime Warranty provided with this cable from the manufacture, Group Gear! 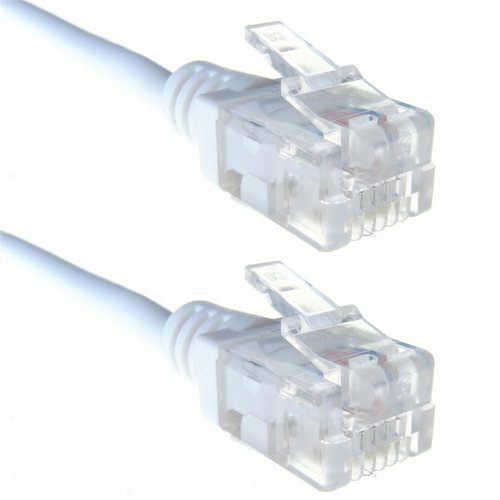 We also have a wide range of Ethernet Cables and Telephone Cables available, along with Cable Clips and RJ11 Crimping Ends. Marvellous connection from Router in loft to PC Office.